Product prices and availability are accurate as of 2019-04-23 18:03:52 UTC and are subject to change. Any price and availability information displayed on http://www.amazon.com/ at the time of purchase will apply to the purchase of this product. Serving size: 1 softgel. Servings per bottle: 30. Medium chain triglycerides, gelatin, sunflower lecithin, yellow beeswax, glycerin, purified water, carob. Contains tree nuts (coconut). No sugar, soy, gluten, dairy, fish, shellfish, yeast, starch, peanuts or artificial additives. Non-GMO. Third-party quality tested. Made in our own manufacturing plant in Orange County, California, which is an FDA-registered and NSF cGMP certified facility. 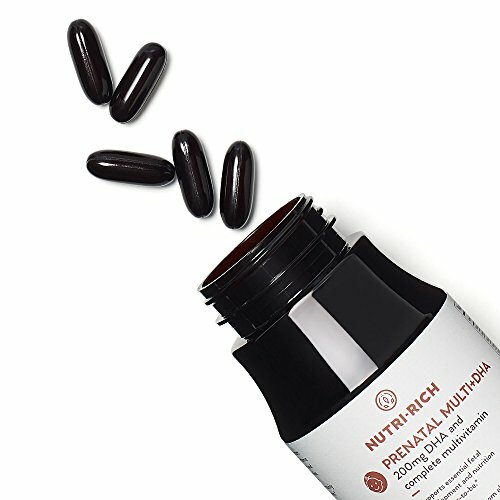 擄 STOP TAKING MULTIPLE PILLS: Many expecting moms end up taking a separate prenatal vitamin and a separate DHA omega-3 supplement. Simplify your life! Our once daily prenatal vitamin with DHA has everything you and your precious little one need! 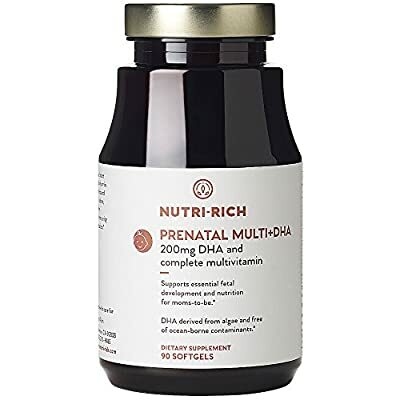 We packed this prenatal vitamin with vitamins A-E, iron, 200 mg of DHA, folic acid, choline and more! 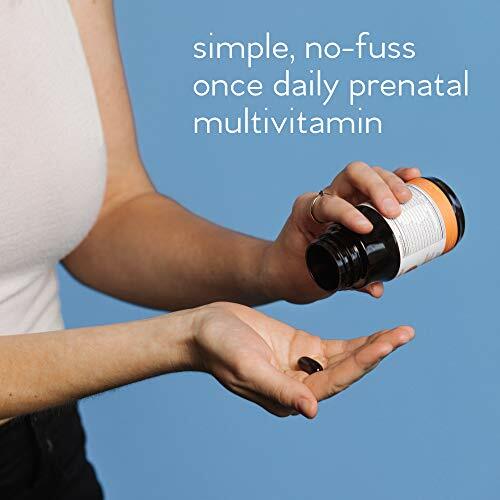 Save money and time by adding our "one and done" prenatal vitamins for women to your cart now! 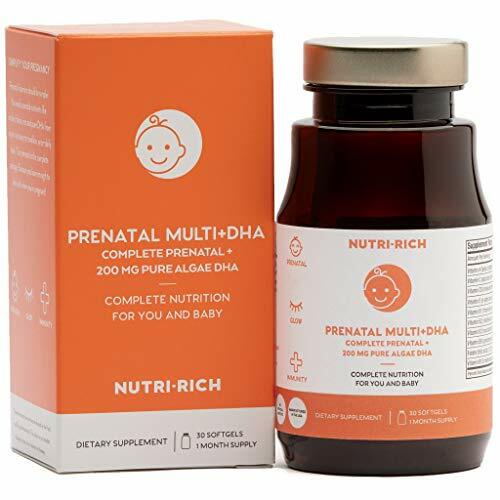 擄 HELP YOUR PRECIOUS LITTLE ONE DEVELOP: Prenatal DHA vitamins are essential for the healthy growth of your baby's brain, eyes and nervous system. Women pass this amazing fatty acid to their babies during pregnancy and afterwards while breastfeeding. DHA deficiency is associated with postpartum depression in new moms and learning disabilities in their children. * 擄 THE SAFEST FORM OF DHA AVAILABLE: Not all forms of DHA are created equal. Many of our competitors use DHA from fish, which often contains dangerous ocean-borne contaminants such as PCB, dioxins & HEAVY METALS! In comparison, our DHA is made from algae which is 100% SAFE from ocean contaminants! Have peace of mind knowing your baby is getting the best nutrients available. 擄 PREMIUM INGREDIENTS ONLY: We added many essential nutrients often lacking in other prenatal vitamins such as B12, folic acid and choline. Folic acid and choline work together, helping prevent many birth defects such as neural tube defects. * Choline also assists in your baby's brain and spinal cord development. * Last but not least, we added iron to help ward off anemia! * Vitamins A-E in our prenatal vitamin will leave you feeling energetic and give you the nutrients you need. 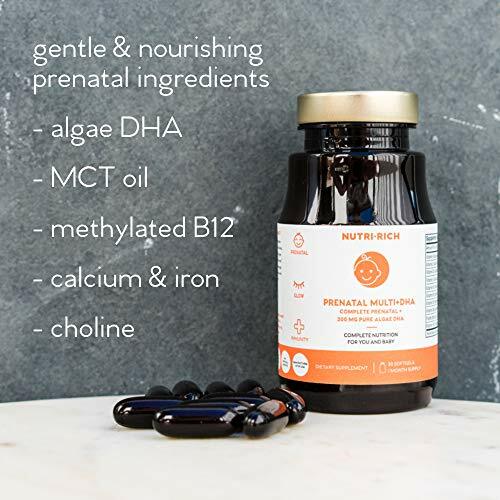 * 擄 MADE WITH LOVE IN CALIFORNIA: Our prenatal vitamins for women are made in our own plant in Southern California that complies with all regulatory bodies. We make sure our products have no soy, gluten, dairy, artificial additives and that they are NON-GMO! We are THIRD PARTY quality tested and NSF cGMP certified, so you can be confident we have the most trustworthy vitamins on Amazon!